to LA are its grand boulevards lined with palm trees. 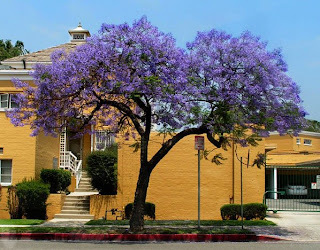 This month a lavender blue upstart enters the scene -- the blossoming Jacaranda tree. Stand under its branches at full bloom and the perfume is overwhelming. 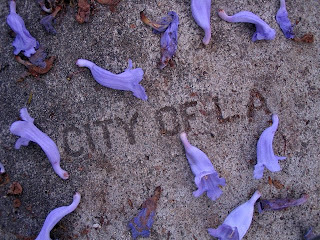 May is the month that launches millions of blossoms carpeting large swaths of sidewalk; drive along 6th Street towards LACMA and it's blue for blocks. However, this beauty comes with a price: the decomposing flower secretes oils to stain auto body finishes and anything else it lays on -- gray sidewalks dye almost black (read the negatives here, and where to find blocks of Jacarandas). 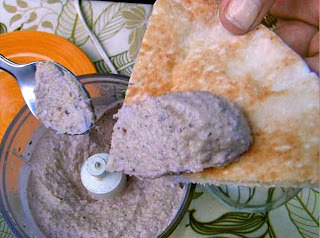 To celebrate this month of blossoms, The 99 Cent Chef serves up a blue video montage of Jacarandas with a purple vegetarian delight -- 99 cent Eggplant Hummus. Play it here. The video runs 2 minutes 55 seconds. 10 - 20 seconds until hummus is creamy. Serve with sliced pita bread triangles and/or fresh chopped veggies (carrots, celery, red/yellow bell pepper, etc.) 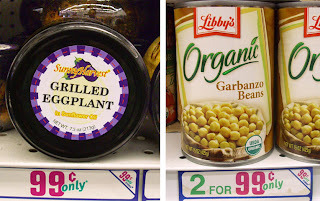 99c only Stores also sell roasted red bell pepper in a jar, so try that sometime instead of eggplant. If your local 99c only Store is out of bottled roasted veggies make a plain one with the above-mentioned ingredients, and the addition of a 1/4 cup of 99c olive oil blend. Great trees and cool Hummus idea! Yummy! This turned out so good and I didn't have sesame seeds and forgot to buy them, so I added a few drops of sesame oil and it turned out great. Billy! LOVE the video and the hummus looks totally divine!! I've been making a similar recipe with roasted eggplants from my garden-yum!